Today is the first day of the new year in the Jewish calendar (5772, to be precise). There’s an advantage to having two new years to celebrate– it means I have two chances to evaluate my progress, come up with new goals, and get a fresh start. Another nice thing about the new year is all the amazing food my family makes! Dishes with apples and honey are traditional, of course, but my favorite treat is mandelbrot. 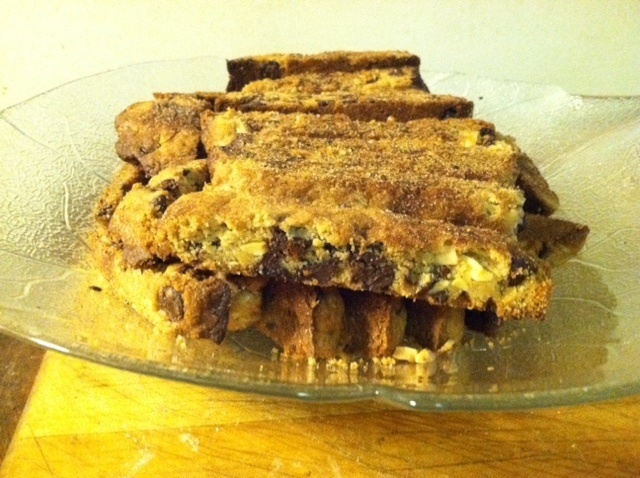 Mandelbrot means “almond bread,” but it’s actually a cookie similar to biscotti. Biscotti means “twice baked,” and that’s how the mandelbrot are made. They’re baked once in a loaf shape, sliced, and then put back in the oven to get nice and toasted. My family’s recipe comes not from our aunt or grandmother but my parents’ friend Jim. He and his wife, Ruth, have been family friends for years, and Ruth and my mother are in a Mah-Jong league together. It doesn’t get any more authentic than that. Preheat oven to 375 degrees F; grease 2 baking sheets. Mix the flour, baking powder, and salt together. Beat oil, sugar, and eggs in a large bowl. Gradually add 2 cups of the flour mixture, beating constantly. Fold in almonds and chocolate chips, then add remaining flour. Mix well by hand. Do not overmix dough. Lightly flour your hands, then divide the dough in quarters and transfer to the baking sheets. Shape into flattish loaves about 3″ wide and 3/4″ high. Combine the remaining sugar with the cinnamon and sprinkle over each loaf, reserving half the mixture. Bake for 20 minutes; remove from the oven and cut each loaf into 1/2″ slices. Turn slices cut side up, sprinkle with the remaining cinnamon sugar, then bake until toasted and golden, about 15 minutes. Cool to room temperature, then store in an airtight container. I always love visiting my family for the holidays, when we can spend time together and cook and bake up a storm. In fact, those are my resolutions for the new year– spend time with the people who matter to me most and cook plenty of fabulous food!